OPEN 7 DAYS A WEEK. FLAT RATES. NO SCAMS. CALL FOR A FREE QUOTE. 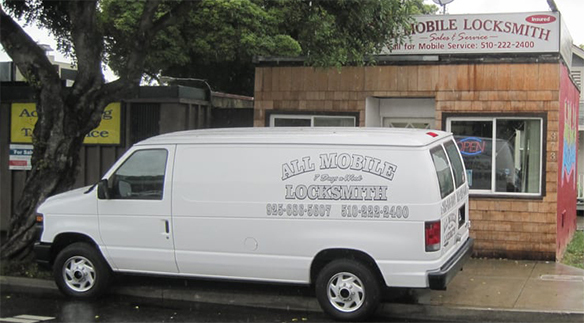 All Mobile Locksmith brings over 10 years of locksmith services to our clients. We provide fast, friendly, and affordable services throughout Contra Costa, Alameda, and Solano Counties.Our expertise allows us to do the job the right way the first time. We take pride in providing high-grade service in a quick and efficient manner. We build lasting relationships with our clients. As a community member providing locksmith services for the past decade, we are proud of the positive and long-term relationships that we build. Our return customers are an essential part of our business and we know that that great prices and good services if the only way for customers to value what we do. Don’t Take Our Word for it – We are rated with an A-grade through the BBB. Read the great reviews about us on Yelp. In addition to the best prices available, we can assist with any of your lock and key needs, installations, transponders, lost keys, lock out service, and much more, we pride ourselves on the fast and friendly service we have provided for more than 10 years. Contact us today for the fastest locksmith response! Emergency lockout service is available 24 hours a day. Don't wait on other locksmiths to return your call, call us and get help now! We use only well known locks and deadbolts in our installations. Unlike other locksmiths, we don't cut costs on our equipment to save money, we truly value your safety and security. Rated A with the Better Business Bureau. We are also very highly rated on Yelp! We are the locksmith that truly values our customers!